The Spanish Primera Division title race is set to go down to wire, although it will take a miracle for Real Madrid to win its 33rd domestic championship following its midweek draw at Valladolid that left it needing a lot of favours elsewhere. Three points for Atletico Madrid at home to Malaga will end Real Madrid’s Spanish Primera Division title dream no matter what Carlo Ancelotti’s team manages to achieve at Celta. And if Barcelona can stay within three points of Atletico going into the final round then the Spanish Primera Division will have a Camp Nou title decider between the top two. Barca drew 0-0 at Atletico in January so, if the Catalan side finishes level on points with the capital team following a home win on the last day of the season, the championship trophy will remain at the Camp Nou for another year. That is because head-to-head results split sides on equal points. One will return to Atletico Madrid and Barcelona but the top play on the Spanish Primera Division coupon is a bet on the relegation six-pointer between Granada and Almeria going under two and a half goals at odds of 2.15 with BetVictor. With two Spanish Primera Division rounds remaining, Granada is 15th and two points above the drop zone, while Almeria is 16th and level on points with both 17th-placed Getafe and 18th-placed Valladolid. One will be able to cut the tension with a knife when Granada and Almeria play their big match. Granada and Almeria have contrasting goals statistics in the Spanish Primera Division and that explains why bookmakers are pretty much inviting punters to take their pick of over and under two and a half goals. Granada’s 36 Spanish Primera Division games have averaged a low 2.36 goals, with 20 of them going under two and a half goals. Almeria’s 36 Spanish Primera Division matches have produced a high mean of 3.11 goals, with 22 of them going over two and a half goals. What has swung one to think that under two and a half goals is a good bet in the Spanish Primera Division game between Granada and Almeria are these reasons. First, Granada has a low goals-scored average for its Spanish Primera Division home matches and, therefore, one thinks that it will not capitalise on Almeria’s porous defence. It is Almeria’s dreadful defensive data that has made it an over team. And second, Almeria has managed a scoring average of well under than one goal per Spanish Primera Division away match. Now it is time to go back to Atletico Madrid and Barcelona. Atletico is a fair price at odds of 1.75 with Ladbrokes to beat Malaga to nil at the Vicente Calderon. 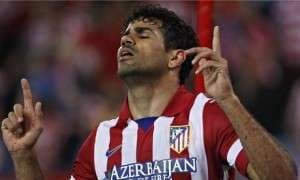 Atletico has conceded a Spanish Primera Division-low nine home goals and Malaga has scored a pathetic 14 away goals, which ranks it fourth worst behind Osasuna, Granada and Getafe. Atletico’s approach is such that it is a much better win-to-nil bet than its Spanish Primera Division title rivals and it won the reverse fixture 1-0 courtesy of Koke’s 70th-minute goal. Barcelona will play Elche in the Spanish Primera Division at the same time as Atletico Madrid faces Malaga. Barca won the reverse fixture 4-0 – it led 2-0 inside the first 16 minutes – and it should have too much firepower for an Elche side that has the worst scoring record in the Spanish Primera Division. One needs to fight fire with fire versus Barca and, unfortunately, Elche does not have the ammunition. Backing Barca at odds of 1.22 with several bookmakers, including Boylesports and Sky Bet, is sound.